"Progress rests on a three-legged stool: academia, government and business." Shirley Ann Jackson, Ph.D., is a theoretical physicist and the first African-American woman to earn a doctorate from MIT, in any field. Her research has helped to elucidate the properties of semiconductors and optoelectronic systems that are useful for many devices today. On May 19, 2016, she was awarded by President Barack Obama the National Medal of Science, the highest award for scientific achievement in the United States. Now the President of Rensselaer Polytechnic Institute, she talked to us for our XxXX interview series – which profiles ten inspiring women in science and technology – about the role universities should play in the Fourth Industrial Revolution. Currently, I am the President of Rensselaer Polytechnic Institute, the oldest private technological university in the United States. It is a position that I have held since 1999. I am a theoretical physicist by background. I have also have worked in the public sector, and continue to have advisory roles for the U.S. government. In the 1990s, I chaired the US Regulatory Commission under President Bill Clinton. I was formerly a member of President Obama’s Council of Advisors on Science and Technology. Currently, I serve as Co-Chair of the President’s Intelligence Advisory Board for President Obama, among other roles. In the private sector, I am on the Boards of Directors of IBM, FedEx, Medtronic plc, and the Public Service Enterprise Group, an energy company. It is a full, challenging, and complex professional life, but all of the different roles play off of each other. Does your own professional life reflect a broader belief that progress comes through bringing different kinds of organisation together? Yes. Progress comes through an innovation ecosystem that rests on a three-legged stool: academia, government and business. Coming out of the Second World War, the great research universities in the United States developed with government support. The fundamental research priorities of universities are often inspired by problems that either governments or businesses need to solve. Business, in turn, is frequently the way in which the applications of fundamental research achieve global impact – although increasingly there is also scope for applications of research to achieve scale through social entrepreneurship or civil society. How has research changed since you started your career in the 1970s? I used computers in my early work, of course, but today we have so much more computational power, and that enables a wider range of approaches to research – from data science and analytics to cognitive systems, artificial intelligence, high performance computing, and genomics. That means we can increasingly tackle problems that are not amenable to exact solutions, of the kind I myself pursued as a theoretical physicist. An example is modelling the likely effect of changes in the climate. Today, big research challenges also create more need to work across disciplines. We live in a world of intersecting vulnerabilities, where systems play off of each other, and one triggering event can have many cascading consequences. Therefore, challenges need to be analysed and addressed at multiple levels. Think of modeling the impacts of climate change, to inform decisions about adaptation and how we should prepare. We need to consider a whole range of challenges – infrastructure, food security, changes in disease patterns, population movement. To think about such issues effectively, we need not only the hard sciences but the social sciences, even the arts and humanities. Every individual researcher needs the intellectual agility to be able to collaborate with others from very different backgrounds and integrate their insights. What should the university of the future look like? At Rensselaer, we have developed and operate under an intellectual construct that we call the “new polytechnic”. The word “polytechnic”, of course, comes from the Greek for “many arts”. It is a concept that recognises that today’s global challenges cannot be solved by one person, one discipline or one nation - alone. With the Fourth Industrial Revolution, breakthroughs will increasingly come from where disciplines meet. We have specifically identified five main research thrusts to bring people together from diverse disciplines, so that they can address challenges from multiple dimensions. Those thrusts are: nanotechnology and advanced materials; energy, environment and smart systems; computational science and engineering; biotechnology and the life sciences; and media, arts, science and technology. In each case, we endeavour to apply the broadest range of advanced tools and technology. To give one example, we have people doing breakthrough work on the Zika virus, applying data science and analytics to pinpoint the key phases in embryonic brain development where the virus is most likely to cause microcephaly in newborns. It is not only about keeping the walls low between disciplines, however – attending to students’ personal growth is equally important. If we want innovation, we have to nurture discoverers and innovators. What are some ways in which universities can encourage students to grow as people? A major change in the academic calendar that we have introduced at Rensselaer is the “Summer Arch” – students start their third year early, in an intense summer session, which then frees up time for them to go off and do something else during the regular academic year – to take a course or do some research or find a way to take what they are doing academically into real life, preferably overseas, and in both developed and emerging economies. If one aspires to create or lead any kind of global enterprise, one needs to really understand what is happening in the world, get a feel for geopolitical challenges, and understand what challenges are amenable to science and technology solutions. One needs multicultural sophistication and the capability to be comfortable operating across a broad intellectual milieu. Students learn not only from working together, but living together. What are your thoughts on how to encourage more women and girls to pursue careers in STEM? There is no greater motivator than to see an opportunity pathway, so it is important for those in power to create equitable pathways – not just for women, but for all under-represented groups in any society. We work to do that at Rensselaer, by increasing the percentage of women and minority group members on our faculty, as well as among the students we enroll. Such approaches have to start much earlier. It is very important for girls to be encouraged in their early years to explore the world, to study science and mathematics to build their confidence, and then to find ways to keep them involved in those pursuits as they progress through the various stages of their education. 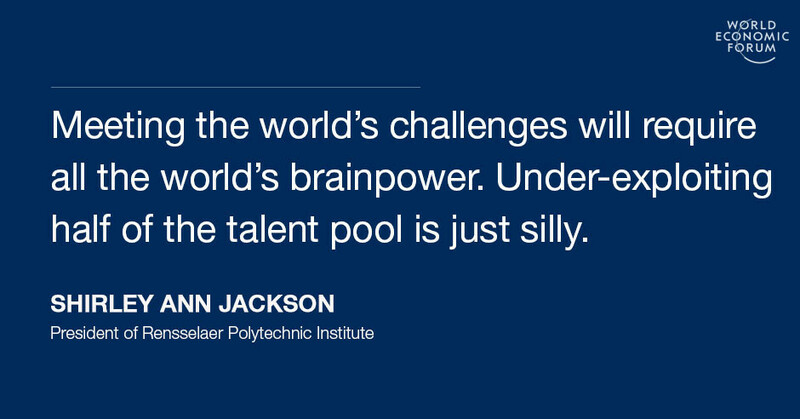 Ultimately, meeting the world’s challenges will require all the world’s brainpower. Underexploiting half of the talent pool is just silly. Q&A: Do our cities make us sick?